The day before Christmas break one of my seminar students brought in the old (1951) video of "The The Day the Earth Stood Still". I worked at my desk as they watched, and about thirty minutes in they called my attention to ask if the math on the blackboard was "real". 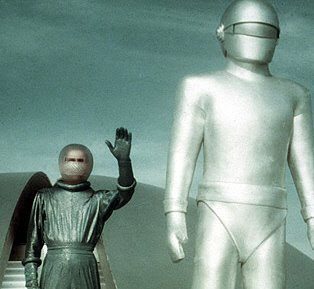 The Alien in the movie, Klatu(Michael Rennie), in the company of a young boy who lived in the house where he was renting a room, had entered the home of a professor who was supposedly knowledgable about Astro Physics. I did not recognize any physics I knew from the brief shot of what looked like differential equations of no particular relation, but that could be my limited physics more than the actual images. I returned to work, but in a few minutes in another scene, Klatu is helping Bobby with his homework and the only line you hear is "All you have to remember is first find the common denominator, and then divide." My head pops up... what were they doing? "Common denominators" leads to thoughts of fractions, but almost no one teaches finding common denominators as a prelude to dividing fractions (which is sort of a shame because it makes division of fractions work like multiplication...the way kids think it should.) It works in fact, if you do not find the common denominator first, but sometimes the answer is as confusing as the problem. When you multiply fractions, as every fifth grader learns, you just multiply top times top and bottom times bottom... 2/3 x 5/7 = 10/21. The fact that division works the same way is often missed, or misunderstood because it so often leads to nothing simpler... 2/3 divided by 5/7 is indeed (2 divided by 5) over (3 divided by 7) but that seems not to give the classic simple fraction we seek. For some fractions, it will work out fine... if 4/27 is divded by 2/3, the answer is (four divided by two ) over (27 divided by 3) = 2/9 and that is the answer you get by the method you memorized (but never understood, most likely) in the fifth grade. I can imagine including some visuals and suggestive images to help it make sense... It is after all, just a reversal of the multiplication process. If we say "3 dogs times 5 = 15 dogs" then by division we should have the eqivalent expressions that "15 dogs divided by 3 = 5 dogs." and just as naturally "15 dogs divided by 5dogs = 3" . Students who have learned (I've been in England too long, I just had to edit "learnt") that "eighths" and "fifths" are just units like "dogs" and "kittens" should then undertand that 5 eighths divided by three eighths is just as clearly 5/3. To illustrate Viete's approach, we can take two simple right triangles, say a 3-4-5 and a 5-12-13 as examples. Viete's method would produce two triangles whose hypotenuses( hypotenii?) were both 5x13 = 65 units. Viete distinguished between the legs calling them base and the perpendicular, so in the 3-4-5 triangle the base is 3 and the perpendicular is 4. It doesn't matter which is called what name, of course except that it reverses the outcomes of the two methods. The Synaeresic method would be to add the products of each base with the perpendicular of the other triangle; 3x12+ 4x5 = 56. This would give one leg of the new triangle. To find the other leg take the difference of the products of the two bases from the two perpendiculars; 4x12 - 3x5 = 33. This completes a triple of 33-56-65. The second method, simply reverses the signs of conjunction. Subtract the two perpendicular x base products and add the two products of a common part. The crossed terms gives 3x12-4x5 = 16 for one leg, while the products of like parts gives 4x12+3x5=63 for the other, completing a 16-63-65 right triangle. "Lang creates creatures of such complexity that it seems impossible that each is composed of a single sheet of paper, no cuts, no glue." "Robert Lang is a pioneer of the newest kind of origami -- using math and engineering principles to fold mind-blowingly intricate designs that are beautiful and, sometimes, very useful. " Origami, as Robert Lang describes it, is simple: "You take a creature, you combine it with a square, and you get an origami figure." But Lang's own description belies the technicality of his art; indeed, his creations inspire awe by sheer force of their intricacy. His repertoire includes a snake with one thousand scales, a two-foot-tall allosaurus skeleton, and a perfect replica of a Black Forest cuckoo clock. Each work is the result of software (which Lang himself pioneered) that manipulates thousands of mathematical calculations in the production of a "folding map" of a single creature. The marriage of mathematics and origami harkens back to Lang's own childhood. As a first-grader, Lang proved far too clever for elementary mathematics and quickly became bored, prompting his teacher to give him a book on origami. His acuity for mathematics would lead him to become a physicist at the California Institute of Technology, and the owner of nearly fifty patents on lasers and optoelectronics. Now a professional origami master, Lang practices his craft as both artist and engineer, one day folding the smallest of insects and the next the largest of space-bound telescope lenses. Looking at the dozens of gifts under my tree, and aware that I don't really need anything, I am led to think about all the people in the world who will go hungry, cold, and ill this Christmas. While such ideas were percolating through my head, Erin Fry sent me a note about some people who are out there making a difference, and so I thought I would tell you about a few ways I think we can help out..
My students contribute to Water for People and it is one of my two favorite charities. What can be a more basic human need than clean water, yet for much of the world it is difficult or impossible to come by. I just learned about el puente a charity in Costa Rica, it started out sharing a dish of soup with a local who searched through their garbage cans for food, and has become a source of support for poor in the area to feed, help pay the educational support, and provide microloans. "Although public education is free in Costa Rica, there are mandatory costs of attending a public school for things such as shoes, uniforms, books, supplies, and class photographs. The "start-up" expenses total more than $156 per child, with ongoing expenses of nearly $2.25 per week, to include breakfast/lunch and copy charges for exams. The Bridge helps families meet this need. " Sounds like the kind of thing a teacher like me could support, and I do... How about you? If you are not familiar with micro-loans, it is a great way to get money into the hands of the poor around the world and build an economic base instead of just continued dependence on someone else. The hard part is having someone in all the regions of the world to manage the loans... Presto! Kiva to the rescue.. If you can't afford to donate in this economy, how about a zero interest loan for six months to a year.... build the third world economy and then get your money back... or reinvest it in another Kiva loan... you can even screen your own loans. Kiva is one of my personal favorite charities. Another great project is the Brenda Boone Hope Center Foundation in Meru, Kenya. Student reading a medical Journal to Teacher: What is the meaning of ideopathic? Teacher, without looking up: "I don't know." Student: "Ok, I'll look it up." He walks to the dicitionary and looks it up... moments later the dictionary is slammed shut, and as he passes the teacher..."That was NOT funny." Teacher:"My personal feeling is that it would be, if you checked the etymology." If you are curious, or confused, see here and don't forget to check the etymology. If you are a student, let your parents listen. They may actually remember the original, which you can hear here . In my last post I mentioned the mediant of a pair of fractions and its application in what is called the Farey Sequence. I mentioned that the property was considered a "curiosity" in mathematical number theory. Then I was called to task for this usage by Domingo Gómez Morín who has spent a considerable amount of time trying to convince people that the mediant, or rational mean as he prefers to call it, is a valuable mathematical tool. He has some nice work on a web page where he shows that the rational mean is a) a general case of both the harmonic and arithmetic means as well as the geometric (not shown on his page) and golden mean, and b) an excellent tool for finding roots (both real and complex). He has thought through all this for so long that it would be a travesty for me to try to explain his work, so check it out for yourself. And thanks to Mr Morin for the reminder...he had sent me a link before and I have a note to look more deeply into it... now I shall. John Farey was a geologist, not a mathematician, but he is better rememberd today for a single short (four paragraphs) paper he wrote in 1816 than for all his good works in geology. In that year he sent a paper to the Philosophical Magazine (or at least it was published in that year) called On a curious property of vulgar fractions .and described a pattern that appears in sequences of what we would today call common (vulgar is the latin term for common) fractions, like 3/8 etc, which are in simplest terms. They observation has almost NO practical use, not even to prove other things mathematically, and yet, it seems to have all kinds of interesting properties that tend to keep us fascinated with it. If you have never been introduced to it, here is a brief description, and some novel relationships that I think are interesting, with some links to places where they are made clearer than I could do in this brief space. 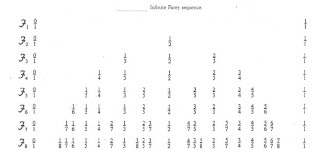 The "curious" thing that Farey noticed is that if you ignore the way your fifth grade teacher taught you to add fractions, and do it the way YOU would have added them, "add the tops, add the bottoms", then each number in the sequence is the sum of the terms on each side of it... for example 1/4 and 2/5 are on each side of 1/3, and if you add by this approach you get (1+2)/(4+5) = 3/9 and that simplifies to 1/3 . The number obtained by adding two fractions in this fashion is often called the mediant . OK, so that is how you make them. Our first question might be, how many of them are there? F(5) obviously has eleven terms (I counted). If we picked a value of N, what would be the number of fractions in the set F(N). A little investigation would show that F(1) = 2 (0 and 1); and F(2) = 3 (0, 1/2, and 1). So how many would be added to the next set... and the next... it turns out that each new set will have all the values of the previous set (of course) and will add one for every value of one through n that is co-prime (has no common divisors) to n. So the set for N=6 will have the eleven terms of F(5) plus 1/6 (one has no common factor with six), and 5/6. (notice that 2/6, 3/6, and 4/6 are already in the sequence in F(5) in simplified form)... thus F(6) has thirteen terms.. and in general we get a recursive formula that say the Order of F(N) = Order of F(n-1) + φ(n). wikipedia article is a nice place to see how they work, and I need say no more as it shows the circles for F(5). What is amazing is that each circle is tangent to every other circle for a fraction it will be adjacent to in ANY sequence.... ahhh, go on..say "cool". It is the only prime that is the average of two consecutive Fibonacci numbers. ... (Ok, that would be 13 and 21... now the only way Fibonacci numbers can have an integer value is if they are both odd [there are no consecutive even Fibonacci numbers}, and all the even Fibonacci numbers are twice the average of the two previous values... so there can be no Fibonacci number after 34 which is twice a prime) It is interesting that there are lots of odd prime Fibonacci numbers, 2, 3, 5, 13, 89, 233, 1597, 28657, for example , Sloane's A005478, and each of them has a prime index (except three, which is f4). It is the least integer such that the sum of its digits in every base B = 2, 3, 4, 5, 6, 7, 8 is prime. (In base two ,17 is represented as 10001 and 1+0+0+0+1=2, a prime number; in base three it becomes 122, 1+2+2=5; in base four it is 41, in base five it is 32; in base six it is 25; in base seven it is 23; and in base eight it is 21... but in base nine it becomes 18, and 1+8 = 9 is not prime.) which makes me wonder... is there a prime number for which the sum of the digits in all bases two through ten is also prime? Everyone knows the stress of testing can be detrimental to students, but it seems that some college professors have observed that it can be even more hazardous to their family members. Recently I came across a (very tongue-in-cheek) article by Mike Adams of the Biology Department at Eastern Connecticut State Univ. about the strength of this effect. "It has long been theorized that the week prior to an exam is an extremely dangerous time for the relatives of college students. Ever since I began my teaching career, I heard vague comments, incomplete references and unfinished remarks, all alluding to the "Dead Grandmother Problem." Few colleagues would ever be explicit in their description of what they knew, but I quickly discovered that anyone who was involved in teaching at the college level would react to any mention of the concept. In my travels I found that a similar phenomenon is known in other countries. In England it is called the "Graveyard Grannies'' problem, in France the "Chere Grand'mere," while in Bulgaria it is inexplicably known as "The Toadstool Waxing Plan" (I may have had some problems here with the translation. Since the revolution this may have changed anyway.) Although the problem may be international in scope it is here in the USA that it reaches its culmination, so it is only fitting that the first warnings emanate here also." The basic problem can be stated very simply: A student's grandmother is far more likely to die suddenly just before the student takes an exam, than at any other time of year. "While this idea has long been a matter of conjecture or merely a part of the folklore of college teaching, I can now confirm that the phenomenon is real. For over twenty years I have collected data on this supposed relationship, and have not only confirmed what most faculty had suspected, but also found some additional aspects of this process that are of potential importance to the future of the country. The results presented in this report provide a chilling picture and should waken the profession and the general public to a serious health and sociological problem before it is too late." The rest of the article goes on to "document" the existance of the effect, and prescribe potential interventions." A couple of email questions asked about the birthday problems... One questioned the assumption that births are not uniformly distributed in the months (or days of the month)... which is quite true, and worth backing up with some info, but it actually makes the probability of a match MORE likely at n=23 than it would be if the births were uniformly distributed. A Math Trek article by Ivars Peterson has a table of monthly probabilities showing the daily frequency of birth each month. September seems to be the most popular month, but the differences are almost negligible in the total probability calculation. A greater difference is due to the fact that in modern times, far fewer people are born on a weekend. Induced labor saves many doctors from a spoiled yachting weekend. The Fathom Graph below shows the distribution of birthdays for births in the U.S. in 1978. It was used by Professor Geoffrey Berresford in his article: "The uniformity assumption in the birthday problem, Math. Mag. 53 1980, no. 5, 286-288." If you plot a times series of the data you will have a nice example of periodic data. The saturdays and sundays show up well below the others, (yearday.jpg)... The atctual data can be found at the Chance Data Base at Dartmoth. One more graph, this one from the Skeptical Inquirer on line magazine. It relates to the probabilty of a match or near match (one day apart) with n people. 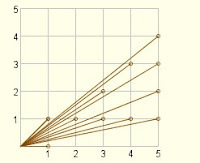 The curve shows the probability of a match on the vertical axis, and the number of people on the horizontal. The dots are for the traditional problem, and the solid line is the "near match" probability. Took a trip up to Edinburgh over the holiday (Thanksgiving in America, but it was St. Andrews day in Scotland) and had a wonderful time. 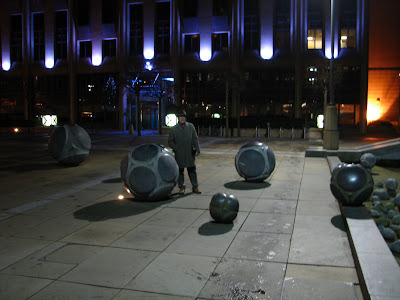 Must have walked past the Sheraton five times before I noticed that they had huge models of the Neolithic Stone balls that resemble the Platonic Solids. In the picture above I am standing by one that shows the symmetry of the dodecahedron, and others show all the Platonic solids, as well as some other polyhedral models. The actual balls range from two to eight inches in diameter. "On neolithic carved stone balls: There are nearly 400 of these objects found in various sites in Scotland and now in various museums and private collections. They include various regular and semi-regular solids, alternatively they can be seen as arrangements of knobs - from 3 to 10 and then various numbers up to 160! Some of them are decorated, notably the tetrahedral Towie stone. 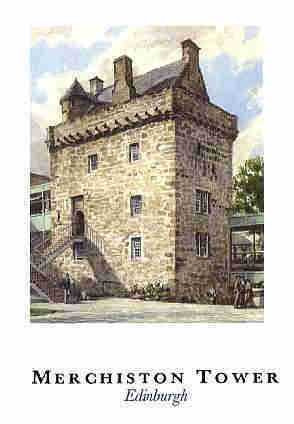 now in the Edinburgh museum (which stocks an excellent coloured postcard). . I have a baked clay model of this stone, bought from a shop in Avebury, Wiltshire." "J Frazer is quoted as taking the grooves to be meant for thongs so that the balls could be hurled through the air "uttering oracles in a whistling voice which a wizard was able to interpret". I have been unable to trace this quotation, and the author was unable to help me at the time I inquired. The Ashmolean museum, Oxford, has a number of balls, kept in a drawer - I have handled these and they are certainly as remarkable as Keith Critchlow has pointed out. "These neolithic objects display the regular mathematical symmetries normally associated with the Platonic solids, yet appear to be at least a thousand years before the time of either Pythagoras or Plato." (K Critchlow, Time stands still, London - Gordon Fraser, 1979, p133 - this book has some splendid photos of various stone balls.)" There have been various attempts to guess at what the balls might have beenmade for. The nineteenth century archeologists who excavated them thought they might be weapons - whether as pike heads, or hurled from slings, or used in games or perhaps for divination. It seems that the balls were never found in personal graves, so it has been suggested they were a sort of ceremonial conch, a prized possession of the tribe. Contemporary archeologists tend to be more cautious. According to Dorothy Marshall, "there is so little hard fact to be extracted from the evidence available about the carved stone balls that postulation as to their evolution and use if very difficult." ( D Marshall, Carved stone balls, Proc Soc Antiq Scotland, 108 (1976-7) 40-72 - this is the most up-to-date and authoritative account. Some previous papers in the same journal are to be found in 11 (1874-6) 29-62 and 48 (1913-4) 407-20.)"
. 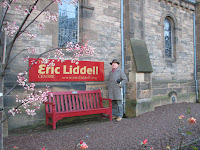 Nearby on Morningside Drive is the Eric Liddell Center, a living memorial to Eric Liddell, the rugby star and first Scottish Olympic gold-medalist (you remember, "Chariots of Fire!") which has been serving the local and wider Edinburgh community for more than twenty five years. (Liddell died in 1945 in China just before the end of the war). In an August 8, 2008 poll in The Scotsman newspaper Eric Liddell was voted as the most popular athlete Scotland has ever produced. Sometimes good guys finish first. Sarah Palin is NOT alone! It started out as just a joke. I sent a copy of a cartoon from xkcd (see above) to the local Gov/History teacher who is my resident Election junkie, Mike Keegan, that I thought he would like. He Responded with a survey that apparently was failed by most Americans and the people they elected to represent them. The Story caption reads: "WASHINGTON (AFP) – US elected officials scored abysmally on a test measuring their civic knowledge, with an average grade of just 44 percent, the group that organized the exam said Thursday." It continues to add that "Ordinary citizens did not fare much better, scoring just 49 percent correct on the 33 exam questions compiled by the Intercollegiate Studies Institute (ISI)." "What happens to the birthday problem if you switch to a different number of days in the year (say 400 or 1000) or what if we use weeks or months... in short, is there a general formula for the number of people to reach the p=1/2 that there is at least one match?" The problem can be attacked in the same way as shown above for any number of categories, but a nice approximation (I believe this was from Perci Diaconis) is that for n categories, the approximate number of selections to have a probability of 1/2 of a match is 1.2 times the square root of n. So for 1000 days it would be about 38 people. You can reach 95% confindence of a match by adjusting the formula to 2.5 times the square root of n. This means that you can be 95% sure of a match for the conventional 365 day case with only 48 people. The second problem asks, "what is the number of people needed to make the probability that EVERYONE has a match equal to or greater than 1/2?" This is called the "Strong Birthday Problem." I will leave it to you to search the derivation of the solution, but it seems that with more than 3064 people, the probability becomes more than 1/2 that ALL of them share a common birthday. "And what if we only wanted to have two people who came close. What is the number of people that must be present to make the probaiblity that at least two have birthdays no more than one day apart?" Well, a little research led me to this, "It turns out, for example, that it takes just 14 people in a room to have even odds of finding two birthdays that are identical or fall on consecutive days. 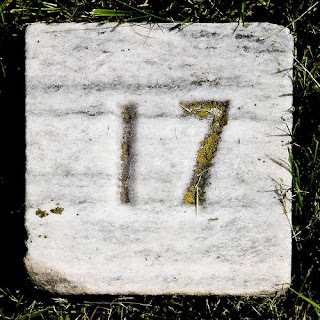 Among seven people, there is about a 60 percent probability that two will have birthdays within a week of each other. Among four people, the probability that two will have birthdays within 30 days of each other is about 70 percent. " I was a little surprised that it took so few to have either a match or adjacent days. I would think that means that with the traditional 25 person classroom, you might not get a match, but you would almost certainly get a "near-match." "...suppose a group (several hundred) are entering an auditorium, and you know that the first person to enter having a birthday that matches someone already inside will win a prize. Ok, you know not to go first, and if you go too late, it will already be gone.... so where in the line do you insert yourself to have the highest probability of being the first to enter and have a birthday match in the room? " Well if you look at the change in the probability of a match after each person enters the room. This requires only that we calculate p(n) − p(n − 1) and find its max value. It turns out to be twenty, so if you are the twentieth person in line you have a slightly higher chance of being the first match than people before or after you.